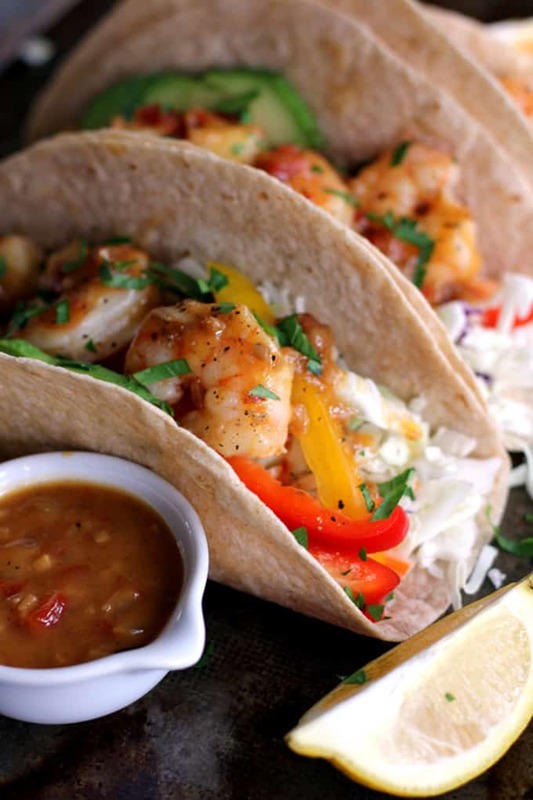 Flour tortillas topped with the crunch of fresh vegetables and delicious sautéed shrimp. 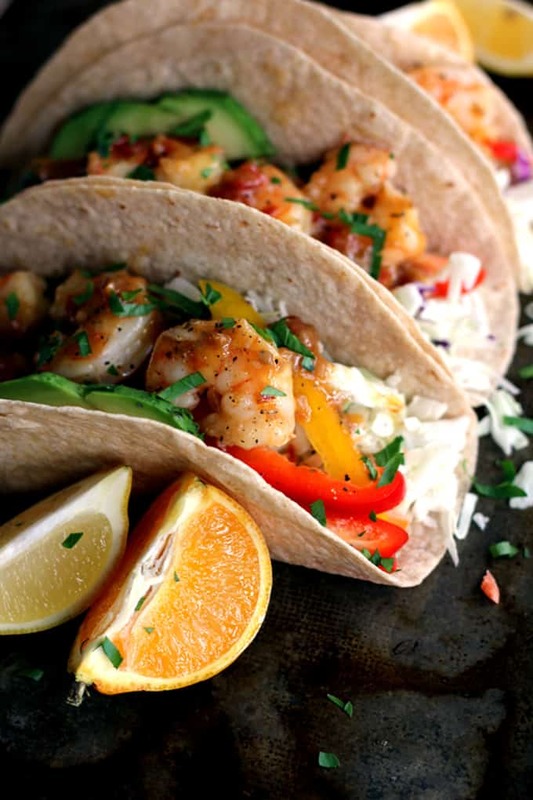 These Rosemary Citrus Shrimp Tacos are not only the most flavorful tacos you’ve ever made, but the only ones have taken just 15 minutes to prepare. I debated about what to call these tacos. 15 Minute Tacos? 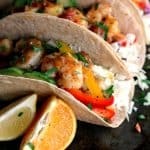 Easiest Shrimp Tacos Ever Tacos? So Easy You’ll Want to Have Them Every Night Tacos? All absolutely true, but the names were rather lengthy so I simply went with Rosemary Citrus Shrimp Tacos. This is one of those recipes – and really, recipe is a really loose term here – that will take you longer to prep the vegetables than to actually cook the shrimp. If you can use a knife to cut peppers into strips and avocados into slices, you’ve pretty much got this main course mastered! I love the juxtaposition of fresh, crunch vegetables paired with the sauteed shrimp. The rosemary and citrus flavors from the sauce? A knockout combination. I loved it so much I even added more sauce to the top of my tacos along with a squeeze of the tangelo that I was using as a garnish. And if tacos are your jam, you’ll also want to schedule your menu plans for Taco Tuesday to also include my Slow Cooker Lentil and Brown Rice Tacos, Slow Cooker Honey Mustard Pork Tacos with Candied Bacon and my mashup Taco Bubble Pizza. Fresh citrus and seafood while the snow is still swirling outside my window at the end of March? I’ll admit, it was most definitely the bright spot of my day. So much so that it will be on my menu again. And soon. 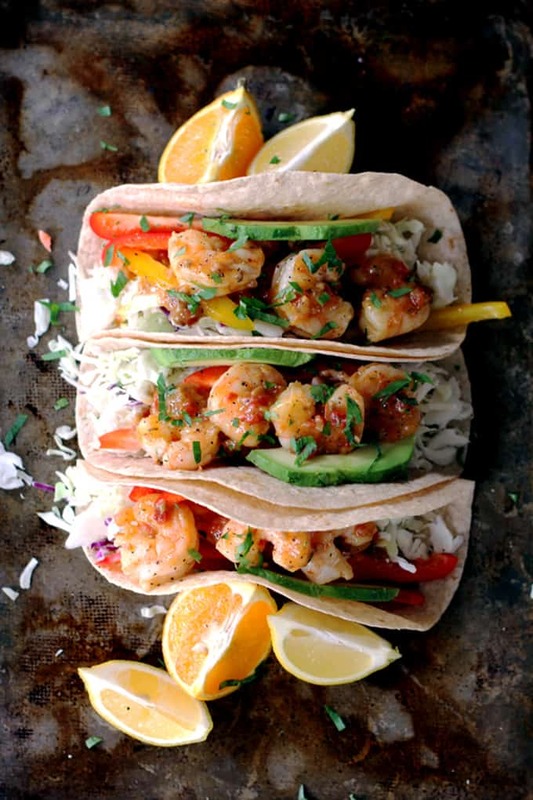 Flour tortillas topped with the crunch of fresh vegetables and delicious sauteed shrimp. These Rosemary Citrus Shrimp Tacos are not only the most flavorful tacos you’ve ever made, but the only ones that you’ve taken just 15 minutes to prepare. Stir in 1 cup of Rosemary Citrus & Papper Sauce and warm through. Remove from heat. 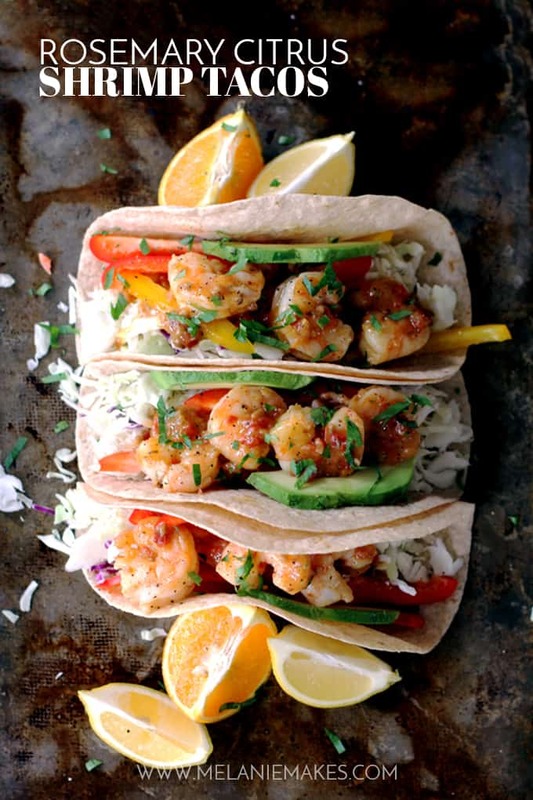 Assemble tacos by topping a tortilla with cole slaw, pepper strips, avocado slices and shrimp. Taco Tuesday forever! You’ll also want to try this Korean Beef Tacos recipe, these juicy Slow Cooker Pork Tacos with Mexican Coleslaw and the Best Mushrooms Tacos. 15 minutes!! You are speaking my language here :) Love the rosemary in here! Never would have thought to add that! I won't be able to stop eating these! That's why it's so good they only take 15 minutes to prepare! Thanks for solving tonights dinner!! these look incredible!! Perfect for our next taco night!! mmmm..these shrimp tacos are faaantastic!! My family would LOVE these! They are one of our favorites! Shrimp tacos are seriously my favorite thing ever! I have no doubt you'll love these, Jocelyn! I love this recipe. Avacado was a nice touch! Double the avocado for me, please! I went to the Robert Rothschild Farm website and cannot find the Rosemary Citrus & Pepper Sauce. Going to try and contact them directly to see if they still make it. Really want to try these - they look delicious!! Hi, Susan -Unfortunately I believe it was a product they were going to discontinue. Let me know if you'd like a suggestion on product substitution! I wish the shrimp recipe came with a recipe to make the rosemary citrus sauce from scratch. They look amazing!! 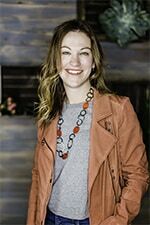 Thanks, Sarah Grace - let me know if you give them a try! Melanie, do you use the coleslaw mix straight from the bag or do you add mayo, etc. like you would for making coleslaw? Hi, Tricia - I use it straight from the bag, no need to mix anything you're simply using it for the crunch factor! I was curious, is there another type of rosemary citrus pepper sauce that I can find at a more local store like Walmart or Kroger's? Hey, Kris - I'd definitely try calling RRF if you're looking for a local retailer. Many grocery stores also carry their products. You are also able to order online as well. I could fill your grocery cart in no time with their amazing products! do they sell this sauce at stores like walmart or target? To my knowledge RRF aren't sold in big box stores, but they are in some local groceries. Your best bet would be to contact them directly through their site or to order from their site directly. I've yet to try one of their products I haven't loved! If you click on the highlighted product and enter your zip code, it will list the stores in your area that carry these products. also what do you mean by cole slaw mix? like regular cole slaw? Hi, Michelle - Cole slaw mix is what you'll find in the refrigerated section at your grocery. Usually in a bag with the shredded lettuce, salad mixes, etc. Hope that helps! I grew up picking raspberries at Rothschild's! They used to have a store right there, and restaurant, where you could buy all their sauces, salsas, jams, etc. But they closed it and I guess are just distributing to big stores now. Your tacos look delicious! Saw you over on Time to Sparkle. Thanks so much, Jill! I've yet to have a product from RRF that I haven't loved. So many delicious products! If you haven't tried their Chili Lime Sauce, you must! We usually eat fish tacos but these sound great! I also have fresh peppers and rosemary in my yard so I might try making a similar pepper type sauce. Thanks for the idea and sharing on Simple Supper Tuesday. I'm stopping by from the Simple Supper Tuesday party. These look fabulous. I need to get this seasoning and try these. Thanks for sharing these. I've pinned. We had shrimp last night and it was the same way - the least time-consuming portion of the entire meal! These tacos look delicious, and I really like the addition of avocado. Thank you so much, Natashalh! It's crazy how something like shrimp can be so incredibly easy! Oh my goodness, Melanie, these looks absolutely AMAZING! Yes, we'd want to have these every night, no question! Love this recipe and thank you so much for sharing at Best of the Weekend - pinning and sharing this week! Hope you have a happy Sunday and a wonderful week! The photo made my mouth water. Yum! I think you just made me like shrimp. No small feat, Melanie. That is quite the compliment, thanks so much Karen! Looks aaaamazing! Sounds like a perfect quick week night dinner! Exactly! The quickest weeknight dinner ever! Be still my heart...these look amazingly flavorful! I love how easy they are! Perfect for a quick and delicious meal! Beautiful pictures! Thank you so much for your kind words, Sommer! Where can I fine the roesmary citrus and pepper sauce? Hi, Jessica! You can order this directly from Robert Rothchild Farm's site or use their store locate function to find it in your area. Hope that helps! Oh wow, Melanie! :) These are gorgeous! They look so fresh- love all the flavors in these! These are going on the list for sure! Definitely trying these once I'm eating fish again!